This grant was awarded to support the work of two scientists at the Wellcome Trust's Africa Centre for Health and Population Studies, a rural HIV & TB research centre in Hlabisa, South Africa, which is based in the University of KwaZulu-Natal. Professor Tulio de Oliveira and Professor Frank Tanser recently showed that antiretroviral treatment can decrease HIV-1 transmission; however the success of the national treatment programme is threatened by rapid drug resistance. 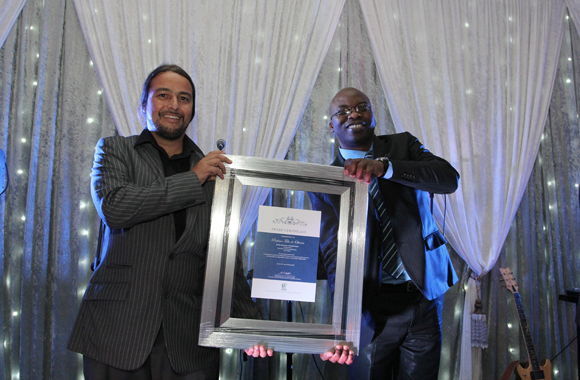 Prof. Tulio de Oliveira receives the award from the Department of Science and Technology (DST) Deputy Minister, advocate Michael Masutha. With the expansion of HIV/TB treatment in South Africa and over 1.8 million patients on antiretrovirals (ARVs), drug resistance is fast becoming a growing problem. Hence, despite significantly rolling out ARVs country-wide, not a lot of attention was given to the individual management of patients with resistance strains. Drug resistance testing was considered to be expensive, time consuming and dependent on high-level technology (such as genetics, biotechnology and bioinformatics). However, the focus is likely to change now. The two ground-breaking studies by Tanser and de Oliveira were published in the leading scientific journal, Science and Nature respectively. Tanser's study found that widespread antiretroviral therapy curbed the rate of new HIV infections in Africa. de Oliveira's study indicated that genomic data which can be used for the clinical management of patients with resistance strains and to understand patterns of HIV transmission, can now be produced cost effectively- locally. This award will allow de Oliveira, a bioinformatician, and Tanser, an epidemiologist specializing in GIS, to work together to produce a unique framework to understand HIV-1 transmission and resistance. In addition, the award will allow them to collaborate closely with six other leading research groups based at UKZN (HEARD, K-RITH, HIV Pathogenesis Programme, Computer Science, Genetics and Infectious Diseases) to develop a framework to prevent HIV transmission and resistance. 'HIV drug resistance is a very serious problem in South Africa, and the recent advances in resistance testing technology and in understanding patterns of transmission will allow us not only to extend the life of patients failing treatment but also to produce policies of national interest that save hundreds of millions of rand in government programs in the next few years', according to de Oliveira. Professor Moses Chimbari, Dean of Research at the College of Health Sciences at UKZN argues 'a multi-disciplinary approach is needed to understand these complex problems in order to translate research results into policies of national interest and to ensure that southern Africa's HIV treatment programs are highly effective. In this regard we welcome this award and expect it to contribute substantial scientific insights into ways of halting and reversing the HIV epidemic'. The Flagship Project grants are the largest medical research grants from the MRC. Public Database for HIV Drug Resistance in southern Africa. de Oliveira T, Shafer WR, Seebregts C, for SATuRN, Nature (2010), 464(7289):673.